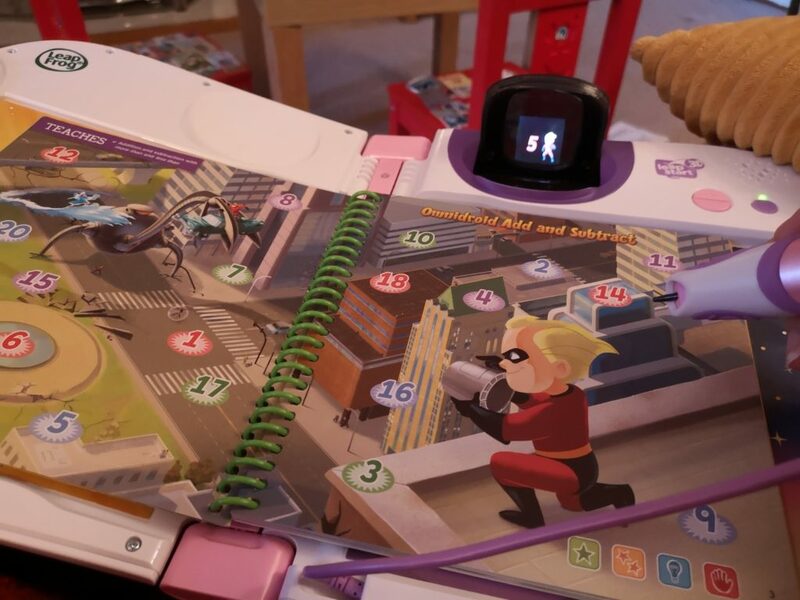 As part of the LeapFrog Play Panel, we were sent two new interactive books for the LeapStart 3D (reviewed here) to test out. As with all of the LeapStart 3D books they are compatible with either the LeapStart or the LeapStart 3D, but you will only have added animations on the newer 3D model. 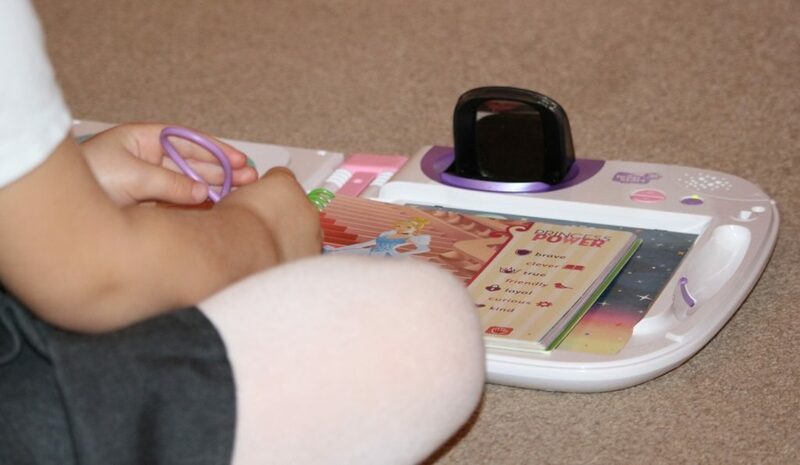 To use the books, first you must download the content to the LeapStart via the LeapFrog website. Connect the LeapStart to your computer with the LeapFrog cable (note that this doesn’t work with any USB cable; I’ve tried!) and touch anywhere in the book for instructions. It doesn’t take long to download. Currently we have five different books including the sampler books loaded on to each LeapStart. Pop the book in by pressing the spine to the clips inside, and you’re ready to go! The first book is a level 2 (preschool) book aimed at children aged 3-6 years. 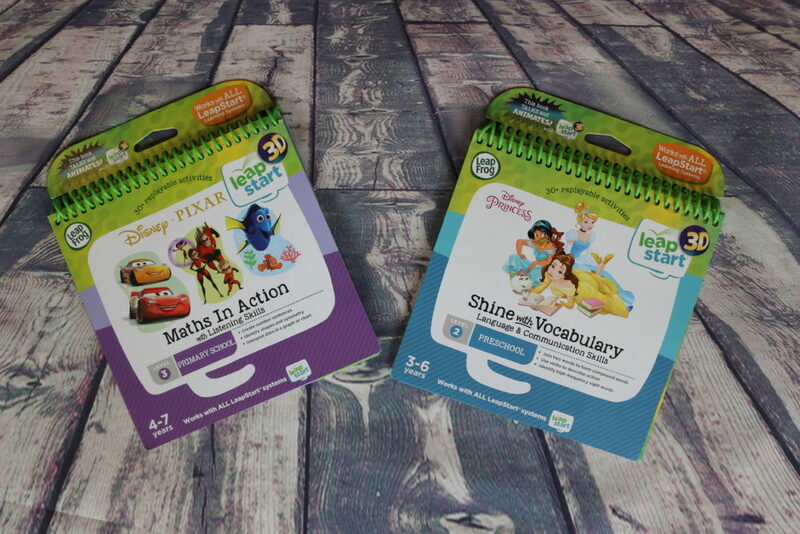 The Disney Princess Shine with Vocabulary LeapStart 3D book helps children to learn language and communication skills with their favourite princesses, Belle, Jasmine and Cinderella. There are activities that introduce prepositions, categorisation, comparisons and emotions, as well as antonyms and synonyms. There are 14 different pages/activities and seven of these have an easier challenge and a harder one; you select the level by pressing the green or yellow star. 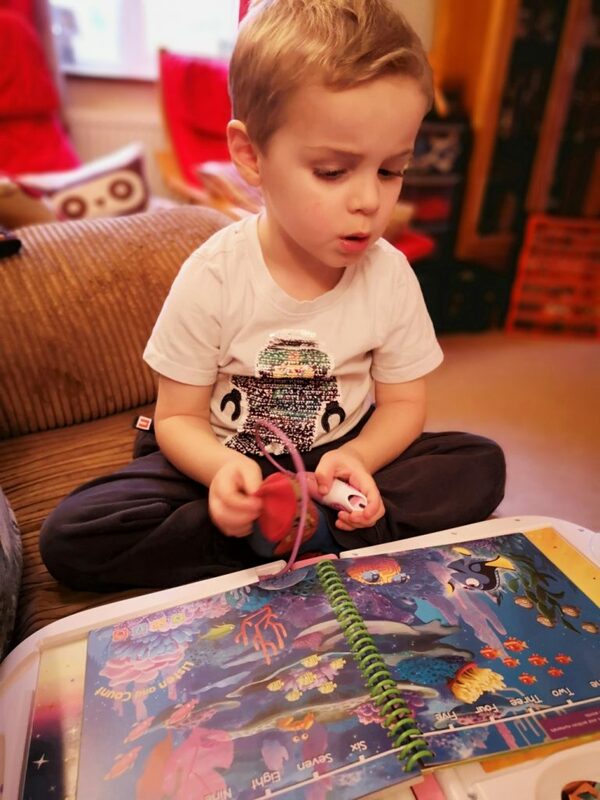 Some pages require reading and letter/word recognition on the harder challenges, but there are many pages that my three year old could cope with and my five year old was able to complete the majority of the book without help. When you complete challenges for the first time you get a sticker to go into your reward chart at the back; this is really exciting for my three year old, less so for my five year old, but she’s princess-obsessed so was happy to complete the tasks without further encouragement. The second book we were sent was Maths in Action with Disney Pixar includes characters from the best Pixar movies including Cars, The Incredibles and Finding Nemo. Maths in Action is a level 3 book for primary school aged children between 4 and 7 years old. To use the book, they will need to know their numbers up to 100, read number words and be comfortable with basic addition and subtraction even for the ‘easy’ (green) level so I’d say it’s for older children to support what they’ve learned at school. 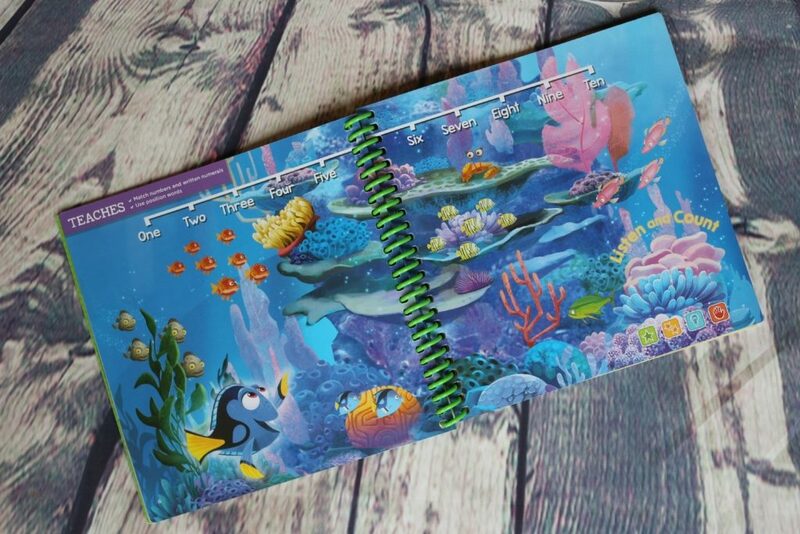 On each page you can press the pen onto the page and you can hear the characters talking or sounds. Press the green button for one activity, and the yellow button for a harder activity which can earn you a sticker to put in your reward chart at the back of the book. Some of the pages were too advanced for my daughter (5) who has no problems with sequences and shapes and number identification, but will need more time before moving on to the graphs and harder adding/subtracting. 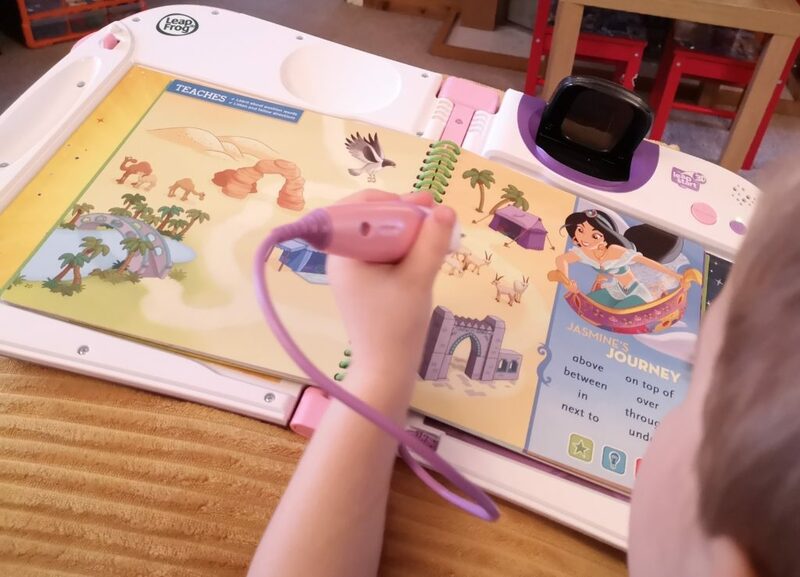 At this stage it isn’t a book that she could work on independently but it has activities many we can work on together and I was actually surprised to find out how much she knew! 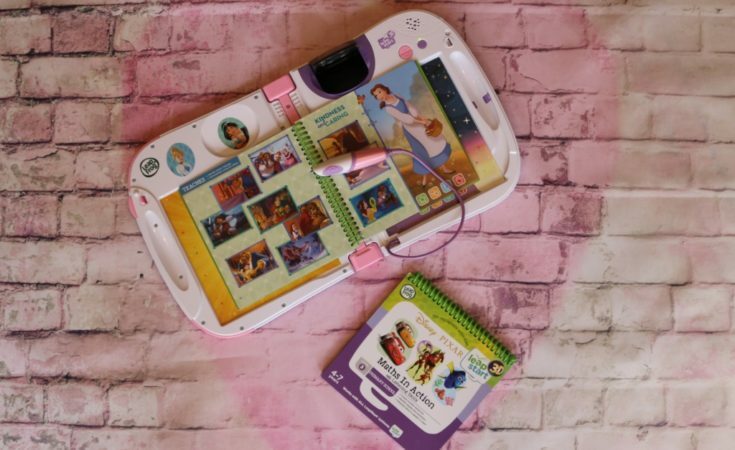 The only downside is that the characters appealed more to my son than my daughter – she just wants to play the Disney Princess game even though it’s not really as challenging for her! The LeapStart 3D books retail for around £10-13 and can be purchased from national retailers or online from Amazon using the links below. The LeapStart 3D is available in blue and green or pink and purple. It has an RRP of around £50 and is available from national retailers or online from Amazon using the links below. 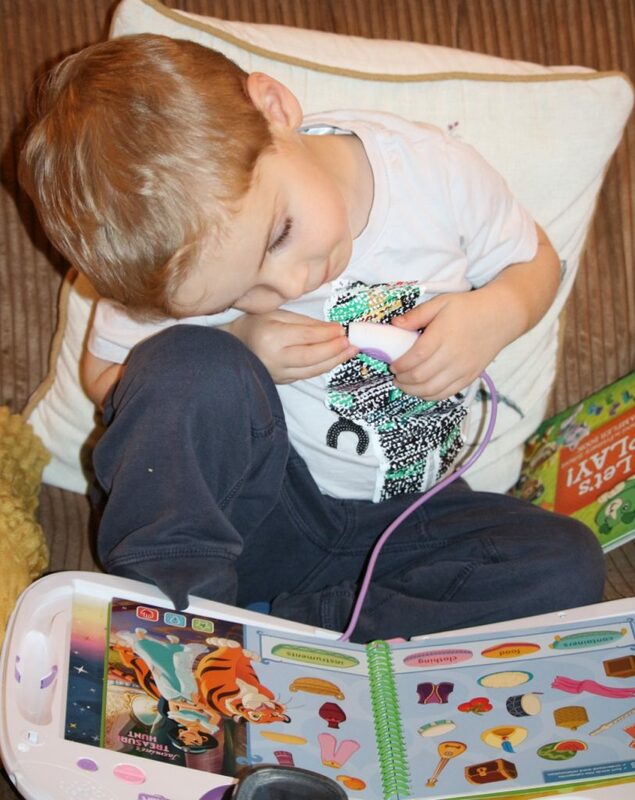 We received these Leapfrog LeapStart 3D books as part of the LeapFrog Play Panel. All pictures and words are mine. You can find out more about the Leapfrog LeapStart 3D on the LeapFrog website and you can follow on Facebook and Twitter for updates.